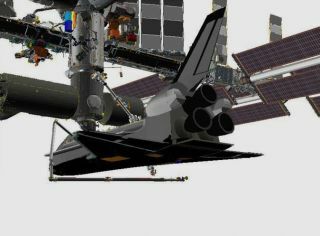 This NASA graphic shows how Endeavour astronauts will use the shuttle's robotic arm and inspection boom to take an extra look at a damaged heat shield tile on the spacecraft's belly on May 21, 2011 (Flight Day 5). Astronauts on the space shuttle Endeavour will take another look at their spacecraft's heat shield this weekend to inspect a damaged tile on the orbiter's vital heat shield, NASA managers said Friday (May 20). Endeavour's crew will spend about two hours on Saturday inspecting a ding in the black heat-resistant tiles lining the shuttle's underbelly, said LeRoy Cain, chair of Endeavour's mission managiement team, in a briefing. The survey, known as a focused inspection, should give engineers on Earth the data they need to clear Endeavour's heat shield of any remaining concerns for its eventual landing on June 1. Cain said engineers have already cleared the rest of Endeavour's heat shield of any concerns, including the six other tile damage sites and heat shield panels along the orbiter's wings and nose cap. They are confident this follow-up inspection will clear the remaining ding, too, he added. "There's nothing alarming here, and we're really not concerned," Cain said. NASA has kept a vigilant eye on shuttle heat shield damage since 2003, when wing damage caused by falling fuel tank insulation during launch led to the loss of the shuttle Columbia during its return to Earth. Seven astronauts were killed. For Saturday's survey, Endeavour pilot Gregory H. Box will control the shuttle's robotic arm to position a 50-foot (15-meter) inspection pole tipped with a camera laser sensor just beneath the damage site. A digital camera will snap three close-up images while the laser instrument records data that will help analysts build a three-dimensional map of the damage. "This is one that we feel pretty confident that we're going to be able to clear once we get some additional data," Cain said. An answer could be ready within 24 hours of the survey, he added. This NASA graphic released on May 20, 2011, (Flight Day 5) shows the internal structure of shuttle Endeavour beneath a damaged tile on its belly-mounted heat shield. Endeavour's six-astronaut crew is currently in the midst of a 16-day mission to the International Space Station to deliver a major astrophysics experiment along with other supplies and equipment. The astronauts were planning to take some time off late Friday (actually the crew's "morning" due to a skewed overnight schedule) to rest up from the busy mission. The astronauts are also expecting a phone call from Pope Benedict XVI in the Vatican early Saturday morning to mark the fact that two Italian astronauts — station crewmember Paolo Nespoli and shuttle astronaut Roberto Vittori — are in space at the same time. Those events should not be affected by Endeavour's extra heat shield inspection, Cain said. "We're not losing any activities by doing this," he added. Endeavour's current mission is NASA's 134th shuttle flight and the second-to-last flight before the 30-year-old program ends later this year. After Endeavour lands, NASA will fly one final mission on the shuttle Atlantis before shutting down the program. That flight is currently slated to lift off July 8.